It can be so hard to get back to your "normal" routine after being off of it for a few days. Last night was very low-key, very quiet. I just used leftover spaghetti squash for our dinner, and we watched a few DVR'd shows. That was about it. This morning I absolutely had to peel myself out of the bed. It was a little gloomy out, so that didn't help matters. Plus I actually had to get up and go to work today rather than spend the day playing, shopping, eating. But, I suppose it's not realistic to think I could do that every day. I'd be fired and then broke for starters. I was not feeling up for a workout at all to be honest. I know it was just trying to get myself to work, back on schedule. Plus, it was 70 degrees outside today, so my running shoes were calling to me. Running outside sounded so much more appealing than having to go to the gym...one...more...time. But, I can't run. I can't even pretend to run. So, spin it was. For the most part, it was a good class. The exception was the two people who held a conversation the entire class. I know I've harped on that before, so I won't go into a long diatribe. But it can be so distracting for everyone else. But, other than that, it was a good class. A nice midday energy booster. Last night I had PT and then had to hit the grocery store. PT ran late, so I didn't get to the store until a little before 6. It was insane. I think everyone was there, and there was absolutely no parking. I drove around for a good 5 minutes before finally snagging a spot. Luckily, the list wasn't too long, so I was in and out fairly quickly. I really just needed to restock the fresh veggies more than anything. 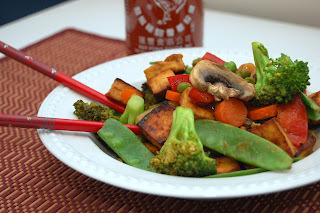 While I had lots of options for dinner thanks to the grocery trip, I decided to go with stir fry. We'll call it Wok Wednesday. It's basically the same stir-fry concoction I did last week with the exception of adding in some napa cabbage. This week I served over brown rice (since I remembered to pick that up yesterday as well). **Oh, and you gotta check out Jessica's recap post of our weekend. I loved her perspective (and her photos).